Fall is a fabulous time of year. You get to breathe in fresh air and enjoy colors that take your breath away. It is also the season where we start to wind down and start to prepare for winter. 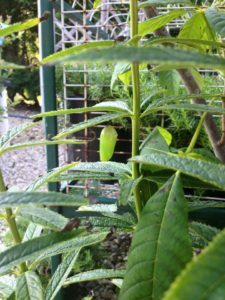 Enjoying those last few weeks and get outside is a goal of anyone who loves to garden, but it can also lead to a long list of things to accomplish. Here is a little advice from the experts on how to properly shut down your yard, so you can start fresh in the spring. Watering is one of the most important items on your to-do list. The best part is that it doesn’t take that much time if done correctly. We emphasize slow watering all year (Slow trickle on the garden hose for a long period of time depending on tree size). Fall is no exception, especially in years of drought. 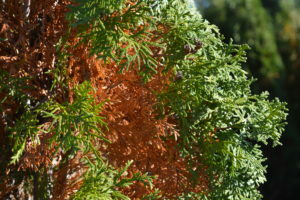 Evergreens are particularly important to check in the fall. 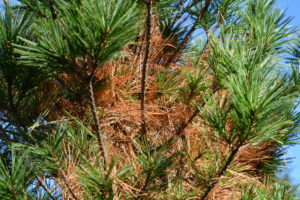 Winter can damage evergreens by transporation (water loss through leaves/needles) from winds. To help prevent wind damage, watering with a slow trickle should be applied at the base of the tree or shrub. While you water, examine your evergreens. Are there any broken branches? Broken limbs should be removed right away. You may also observe that the evergreen is starting to get some brown needles. This is common in the fall and is called ‘winter shed.’ Aside from it being a little unsightly, there is no concern here. You can remove the brown needles by hand but they will fall away on their own. In years of lots of rainfall (2016 was one of those years) fungus on your trees, shrubs, and perennials may become prevalent in your yard. Fall is the best time to treat fungus and prevent it from coming back the following year. 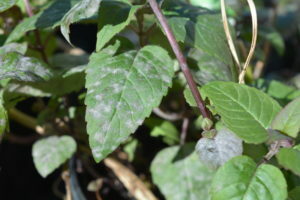 Remove ALL leaves that have spots on them and spray with Ferti-Lome Broad Spectrum Fungicide. Spraying should include the host plant and ground around where the plant was growing; fungal spores may reside on more than just the host plant. Often a follow up spraying should occur about 10 days later and again in the spring (read labels!). Most of us want to clean up our flower beds by cutting back grasses and perennials for an easy start in the spring. 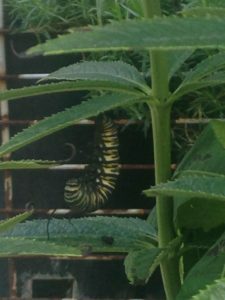 However, it is a good idea to leave many of the perennials and grasses alone over the winter for the butterflies and beneficial insects. Many of these insects/butterflies rely on perennials and grasses to protect them. There are even insect houses that help protect your beneficial insects through the winter months. Grasses and perennials also provide birds with ample food during those tough winter months. For more reading on this topic read this article by the U of I Extension Office – Why NOT to Cut your Perennials this Fall. Although we recommend leaving your perennials and grasses alone until spring, we do however recommend cleaning up many parts of your yard especially your lawn. Early in the fall fresh grass seed should be applied in thin areas to try to thicken grass for winter. This works for places that tend to be muddy once spring rains come or if you have a dog that runs over the same location. Apply fertilizer to entire lawns to thicken grass; we recommend Fertilome Winterizer (New Lawn Starter will also work). Regular mowing is important, but grass blades should NOT be cut extremely short going into the winter months. Lastly make sure that leaves are mowed or raked up off of the lawn. Leaves can create brown or dead spots in the lawn if not removed for months. *Tip – The leaves that you rake up will make a great, inexpensive compost if you have flower and/or vegetable beds. Using chopped leaves will cut decay time and aid in decomposition. 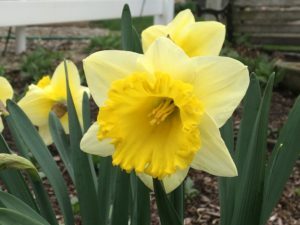 Reminder that Tulip, Daffodil, Crocus, etc bulbs need to be planted in the fall. Bonemeal or Dutch Bulb Food should be applied when planting bulbs to promote root growth and thicken the bulb for sturdier spring flowers. Whether you have a pondless waterfall, fountain, or bubbling stone, fall is the time to clean your basins and pull the pump. The pump should be stored in a basement IN WATER. This will keep all the mechanisms from drying out over the winter and increase the lifespan of your pump. Ponds should be covered with a net to prevent leaves from falling in, unless you would like to get in to clean the pond when it is cold. Depending on pond depth and fish, heating systems may be needed at the intake to keep water flowing. The last topic I would like to discuss is tool maintenance. Going into the winter months, proper tool care is very important. You should clean tools in a 1:1 ratio of bleach and water then dry them. This will kill off any fungal or bacterial residue still on blades. Bleach and water should be applied throughout the growing season as well. Don’t forget to clean out compost buckets, wheelbarrows, and wash garden gloves. After tools are clean, it is a good idea to sharpen everything, because no one likes working with a dull blade. You should apply WD-40 to the tools after sharpening. This will help prevent rust from forming on tools. If rust is a problem consider adding a container of either moth balls, chalk, or silica gel packets to your drawer to draw out moisture.